When the frame is ready for building, the frame-builder begins by filing the lugs; with skill and patience the lugs are cut and filed with hand-tools to create the cut-outs and intricate designs which make Mercian frames distinctive and beautiful. The Vincitore lugs are crafted from plain lugs with spearpoints welded to the plain lugs then drilled, cut out and filed by hand for many hours to create the intricate distinctive look that is unique to a Mercian Vincitore Special. 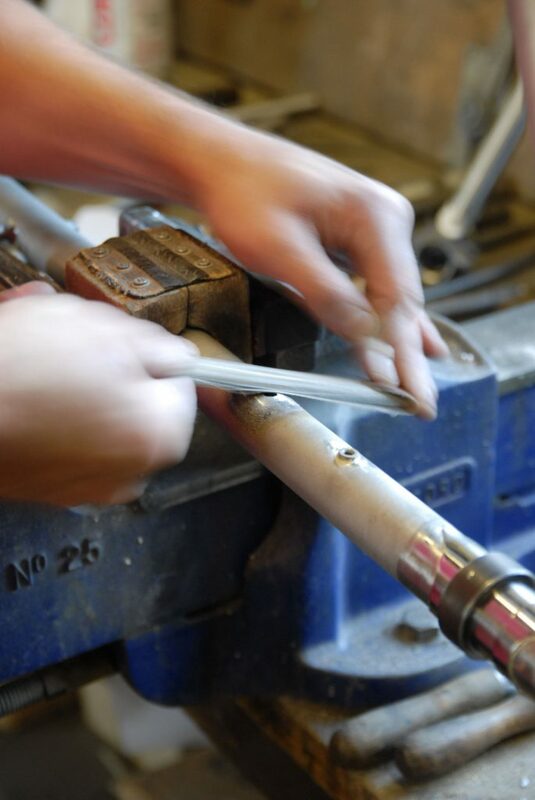 The Reynolds tubes are then carefully mitred and fitted into the lugs and placed against an alignment board where the builder can create the right angles for the frame. The lugs and tubes are fitted together and the frame is pinned to hold securely in position while the frame is brazed in the open hearth. This part of the build process takes years of experience to perfect and has been passed down from frame-builder to frame-builder. The open hearth method of joining the tubes and lugs with a combination of air and natural gas has been used since the 1940’s and reduces the possibility of overheating the tubing, this method is gentler and kinder to the tubes than the quicker frame-jig and oxy-acetylene method often used today, a much higher and direct heat which can be too harsh in the wrong hands. 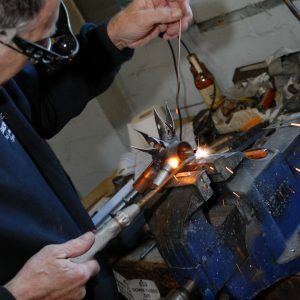 Once heated to correct temperature the brass or silver solder is carefully flowed into the lug/tube joint to secure the tubing in the correct position. 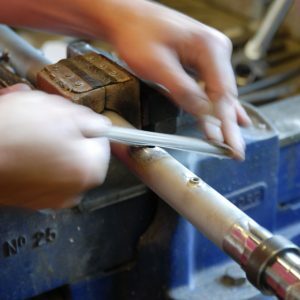 It also means that if a frame tube is damaged in riding, we can undo the brazing and replace a single tube or tubes without a problem, meaning your frame can be repaired rather than buying a new one, giving you many years of pleasure. Lug-less frames are constructed in a similar way with the tubes skilfully mitred by hand to ensure that they sit perfectly together before using brass to join the tubes in place, with the joins filed perfectly smooth to give a sleek and seamless appearance. A lugless option also offers more flexibility with design and geometry, without the restriction on angles of lugs on lugged frames. 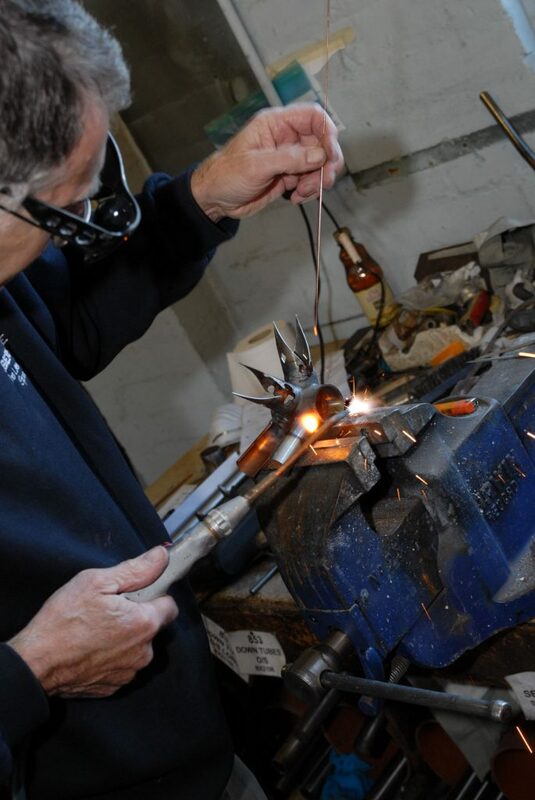 The braze-ons are then added according to the order – bottle cage bosses, cable stops or guides, rack eyes and Ergo/STI bosses. Once the frame is complete and checked for track once more, it goes through for final checking with your chosen wheels and components before the finished frame is shot blasted clean and ready to go into the spray shop. FROM THIS POINT THE SKILL AND ARTISTRY OF THE PAINT SPRAYER AND THE FRAME FINISHER TAKE OVER.